A well-rounded guide covering the techniques and skills needed to succeed in catamaran sailing, for those starting out through to those striving for championship wins. Whether you are a youngster choosing your first cat, a club sailor looking to improve your results, or a seasoned racer embarking on a higher performance model, expert advice from Tom & Brian Phipps will take your catamaran sailing to the next level. Beginning with key theory and seamanship skills, the Phipps’ take you through your early sailing experiences and caring for your catamaran. Developing your skills on all points of sailing, you will be introduced to trapezing, race tuning and racing itself. As your confidence grows you move onto advanced techniques and high performance catamarans. The final section gives you a glimpse of the cutting edge of catamaran sailing with foiling platforms and solid wings. 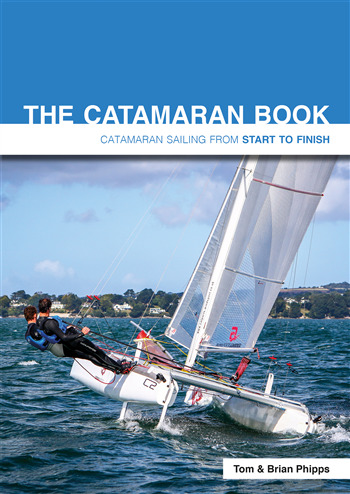 30 focussed chapters are packed with over 350 photographs showing you exactly how it’s done, with diagrams illustrating key boat parts, the various points of sailing and complex on-the-water scenarios with clarity. Whatever your background, your current level or the extent of your ambition, this book gives you all the tools you need to get out on the water and improve your catamaran sailing.